The Scout 195 Sportfish (19’5″ LOA, 8’6″ beam) runs on the builder’s revolutionary NuV3 fuel-efficient, high-performance hull design. The Scout 195 Sportfish has extra-wide gunwales and hull depth help make the boat a truly seaworthy vessel. 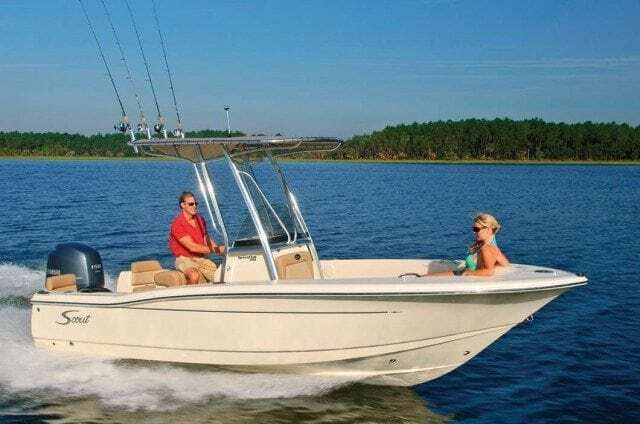 Stainless steel hardware and cup holders, ample rod and tackle storage, a leaning post aerated bait well, and a convenient removable 94-quart cooler in front of the console complete with cushions are among the standard features available. 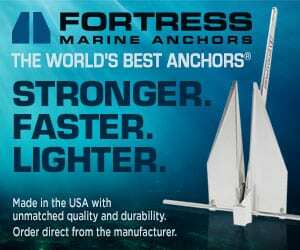 Four stainless steel, flush-mount rod holders, rod storage under the gunwale, and room for four more rods at the console offer plenty of rod storage for you and your crew. An optional T-top comes with rocket launchers as well. 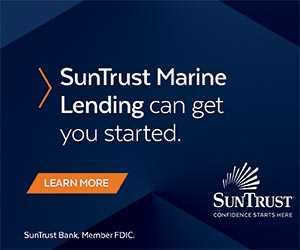 In addition, other standard features include two stern jump seats, a 12-volt plug, compass, glove box, console storage compartment, and swim platform for easy boarding from the water. Optional equipment on the 195 SF includes a JBL AM/FM stereo with iPod jacks, hydraulic steering, Bimini top, bow cushion, leaning post backrest, a folding back rest seat with ski tow, and choice of four hull colors. 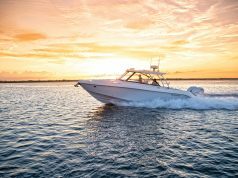 Powered by a Yamaha 150-hp F150 outboard engine, the 195 Sportfish runs to a top speed of 49.1 mph and cruises at 25 mph. An optional T-top comes with rocket launchers as well. In addition, other standard features include two stern jump seats, a 12-volt plug, compass, glove box, console storage compartment, and swim platform for easy boarding from the water. Optional equipment on the 195 SF includes a JBL AM/FM stereo with iPod jacks, hydraulic steering, Bimini top, bow cushion, leaning post backrest, a folding back rest seat with ski tow, and choice of four hull colors. Powered by a Yamaha 150-hp F150 outboard engine, the 195 Sportfish runs to a top speed of 49.1 mph and cruises at 25 mph. Four stainless steel, flush-mount rod holders, rod storage under the gunwale, and room for four more rods at the console offer plenty of rod storage for you and your crew. An optional T-top comes with rocket launchers as well. 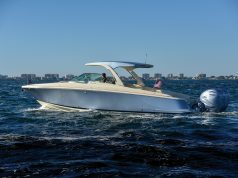 In addition, other standard features include two stern jump seats, a 12-volt plug, compass, glove box, console storage compartment, and swim platform for easy boarding from the water. Optional equipment on the 195 SF includes a JBL AM/FM stereo with iPod jacks, hydraulic steering, Bimini top, bow cushion, leaning post backrest, a folding back rest seat with ski tow, and choice of four hull colors. 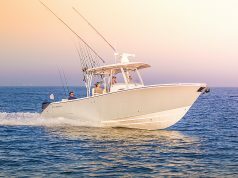 Powered by a Yamaha 150-hp F150 outboard engine, the 195 Sportfish runs to a top speed of 49.1 mph and cruises at 25 mph.